A rather belated post about this year’s Houzz award – received back in January! But still worth a shout don’t you think? 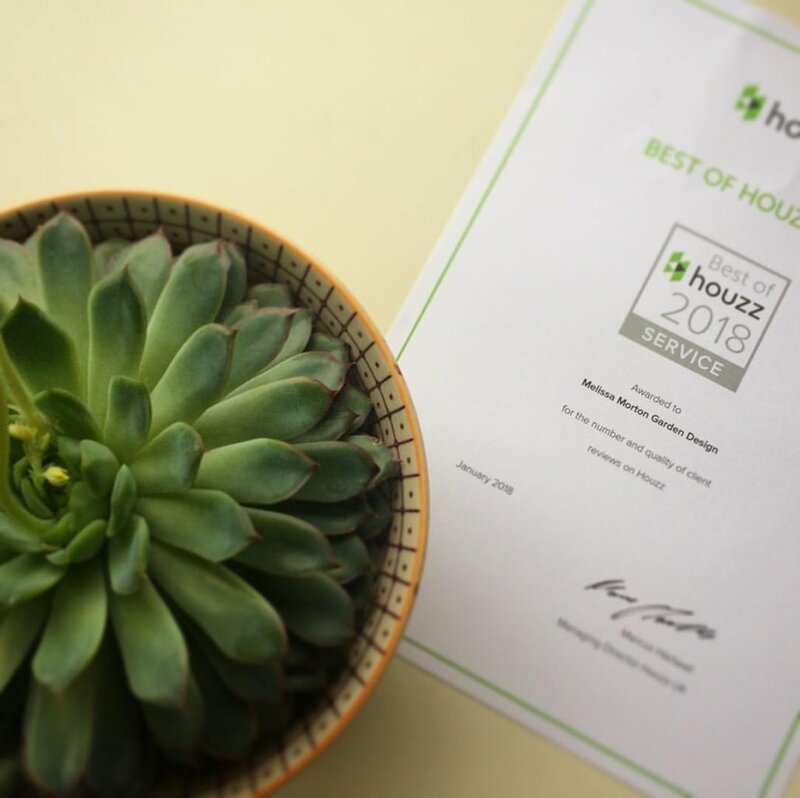 Melissa Morton Garden Design has been awarded the accolade ‘Best of Houzz 2018’ by the international home renovation and design platform, Houzz. This follows two similar accolades from Houzz in 2016 (for Design) and 2017 (for Service). The award. in the Customer Service category for Melissa’s portfolio of services, includes some of the most consistent reviews on Houzz during 2017. To see Melissa’s Houzz profile, click here. Melissa Morton Garden Design, Ilkley, West Yorkshire has won a HOUZZ “Best of Customer Service” award for 2017. This badge rates the business at the highest level for client satisfaction by the HOUZZ community. HOUZZ is the leading platform for home renovation and design. The HOUZZ community consists of more than 40 million monthly unique global users. The Best of HOUZZ is awarded annually in three categories. These badges help homeowners identify popular and top rated home professionals on HOUZZ. Customer Service awards are based on several factors, including the number and quality of client reviews for a professional service. I’m so proud to receive this award; it recognises my commitment to my clients, providing the best service for them. I have been fortunate to have had the opportunity to work on some fantastic projects, working with clients wishing to create their dream garden. In particular I’d like to thank the clients who have taken the time to write and submit a review as I appreciate the time taken out of their busy lives to write feedback which is constructive and meaningful. As a small business owner this is vital to help improve my services. My ‘One-off Consultations’ have been particularly appreciated and valued. They have developed as a direct result of customer feedback. Tailored for people who wish to transform or adapt their garden themselves but don’t know where to start, they offer great value. I try to share as much as I can during the brainstorming session with the home owner. Melissa is extremely knowledgeable, a great teacher and very good fun!… At the end of the 2 hours I felt totally inspired about the future of what is essentially quite a small and uninspiring space. E. Gordon. There are a lot of people out there who want to transform or adapt their garden themselves. They have a lot of ideas but don’t know where to start, how best to phase changes or perhaps need a little direction. I try to leave clients with some inspiration and 2-3 things to focus on to enhance their garden in their own time. The Flash Planting Design was developed for a client who wanted to rejuvenate their borders in time for a June garden party. It worked really well, so is now offered as a NEW service. This HOUZZ award has been a great start to the year, and I’m excited what 2017 will bring. I’d like to let readers know about a promotional discount for my One-off Consultations during February and March – a great way to kick start any changes this year. Go to HOUZZ for more details. A family trip to Edinburgh’s castle during October half term brought an unexpected appreciation of a sensitive landscape design around the ‘new’ Scottish Parliament – ‘sitting in the land’. Walking from parking the car on the edge of Holyrood Park towards the Royal mile we came across and walked alongside the parliament building. A very modern structure (built 1999-2004) juxtaposed to the rugged and natural Arthur’s seat. My 10 year old son, was compelled to take his shoes and socks off to dip his feet in one of the vigoratingly cool pools.